Total: $0.00 Order subtotal does not cover discounts and extra costs like shipping charges, etc. The final cost of the order will be calculated at the checkout page. +/- .125" .250" .500" .750" 1.00"
Our 110 Ton injection Molding Machine is now back in operation. Recently our 110 ton molding machine broke one of it's tie bars. The break was at the treads on the front platen. The platen is where the cavity side of the mold is mounted, this is also the same the side that the plastic is injected into the mold thus forming the molded enclosure. 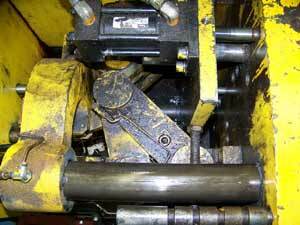 The breakage occurred do to normal wear and tear, due to this breakage our machine was down for four weeks. The repair was time consuming. First the broken bar had to be removed so that a new one could be made. This involved removing the gear nut on the rear platen and the other components that help adjust the mold height. Then we used our fork lift to push the bar out of the holes in the platen and clamp toggle. Once it was removed we sent it out to have a new one made. This took about two and half weeks. Finally the new bar arrived back. Upon arrival we inspected it to insure that it was made properly, that is when we discovered that the rear treads had been damaged during transit back to our shop. The first thing we had to do was determine the extent of the damage so we could decide if we should send it back to the manufacturer. We determined after our inspection that we could repair it in our fully equipped machine shop. So off to the lathe it went. Once on the lathe the next step was the setup. Getting the lathe to follow the existing thread pitch was the trickiest part, simply put it was a trial and error approach. This took a while, taking my time was the only way to approach the job because getting this right was critical, as a simple mistake could trash the new bar. I made a few trail cuts staying away from the actual threads to be sure that I had everything set correctly. Once satisfied that I had the treading tool in the right place it was time to make the actual cut. Making the cuts went fairly smooth. After four passes I tried putting the gear nut on... it threaded nicely. Now back to the broken machine. Installing the new bar was no easy feat. We were not able to use the fork lift to put the bar back in the machine due to the fact that the bar had to be install from the other side of the machine. It took a lot of elbow grease and a nice heavy brass hammer to reinstall the bar. After about an hour the new bar was in place and re-assembly could begin. Assembly went fairly smooth even though it was a bit time consuming. Finally the bar is installed and the machine could be used again. We found that the machine now produces a better part than before leading us to believe that the bar was going bad for a while. Even though the machines get regular maintenance you never know when or how something will break. Click on the video to see the machine in action. When you are looking at the video, the bar that broke was the left upper one. This video was taken before the machine broke. As you can see it has thousands of hours on it. Hi, my name is Mike Early, I am the General Manager for Simcobox and have been employed by the company for the past 18 years. At Simcobox we pride ourselves on being a family run business that puts customer care above everything else. If you become a customer with us, you become a family member too. I really enjoyed reading your article. Thank you. I was a tough job. I just finished perusing the SIMCO website. I read the article you wrote on the 110 repair and I thought it was great. In fact I was blown away and amazed at all of the informative and interesting information you've managed to put up. Great job!! !